Lois & I returned from New Haven, CT and the 5-day journey was just phenomenal. We got a chance to see my classmates and their wives from around the world. Although many incoming of the State Deputies had shared their stories as to how they got to be where they are now; one primary factor was always front and center, God put them on this journey as he did for me and we must “keep the faith” and believe we are on this journey for a reason. Throughout this fraternal year, my monthly messages will include a message on St. Joseph, Patron of Fathers, like many of us are. 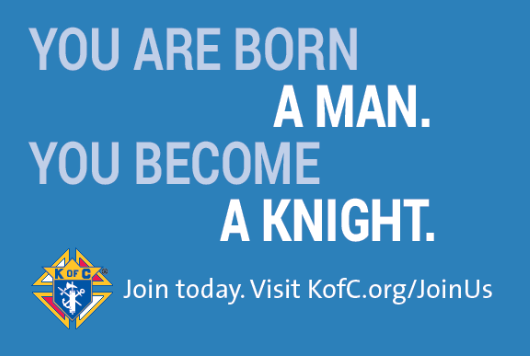 As the State Deputy of Maine, you are a leader of brother Knights and their families; you make decisions based on the welfare of the “family”. That is to recruit new members into the family and to engage those members that have not kept in touch lately. Summertime means reunions, BBQs, vacations, etc., the perfect time to reach out to those new brothers and reunite with our existing brothers. Don’t hold meeting during the summer?? No problem!! Later in this newsletter, we will outline how you can accomplish recruitment even in the summer.